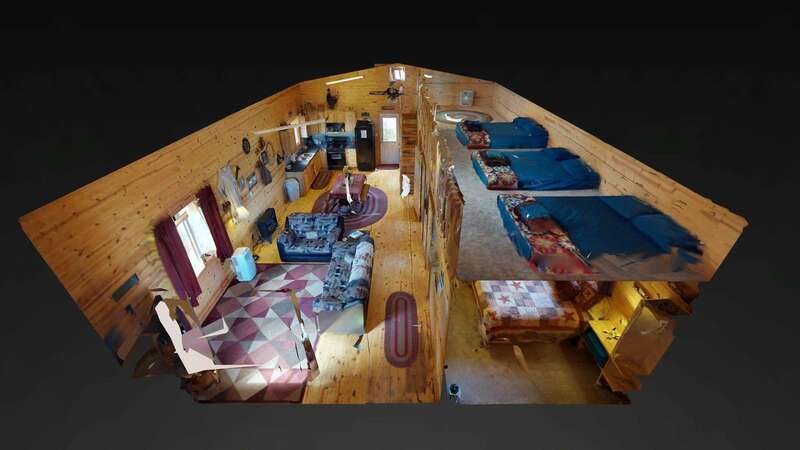 2 Bedroom plus a large 3 bed loft Mountain Cabin with easy access - sleeps 4 adults + up to 6 children in the loft. Forest setting. Central to 14 state and national parks and monuments. You can see it all from here! 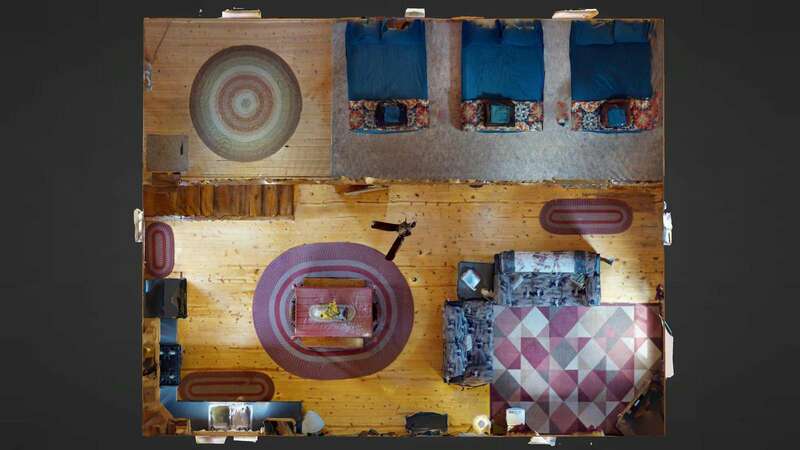 SCROLL TO BOTTOM OF THIS PAGE FOR A 3D VIDEO WALK-THROUGH TOUR! No waiting in lines to check into a hotel here. 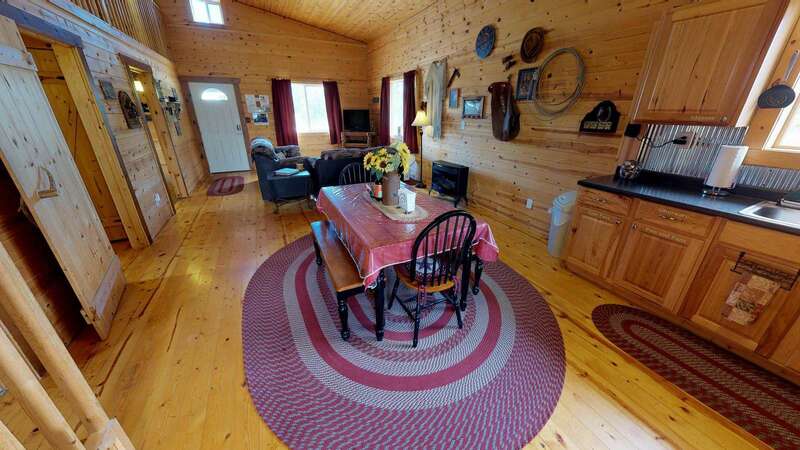 Drive up to the cabin, walk in and you're at home in this stunning mountain Ranch Cabin! Sleeps up to 10 people. 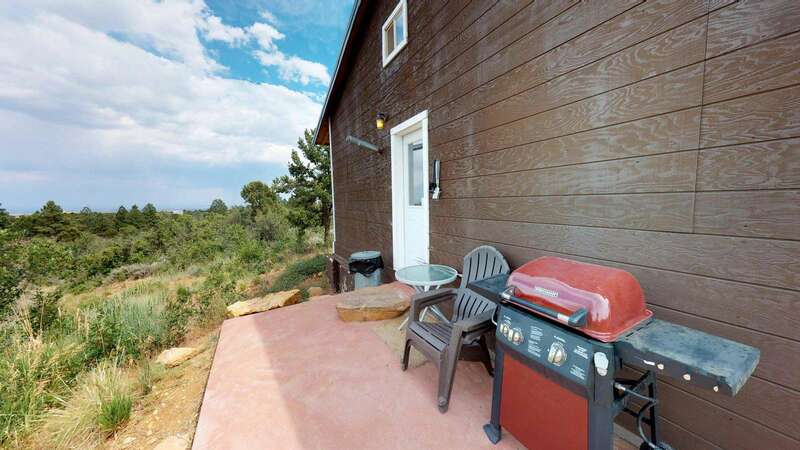 Set in a beautiful location at 7,200' elevation - surrounded by trees and at the foot of the Abajo Mountains, this cabin is the ideal spot to escape to - while remaining central among more than a dozen state and national parks and monuments! Featuring a spacious main level with 2 bedrooms, a full bath w/shower, full kitchen, dining table, and plush sofas. And don't forget the extra loft, featuring double padded carpet and 3 queen mattress beds. Outside you will find a Campfire pit, picnic table, bbq grill and fantastic views with miles of walking trails. 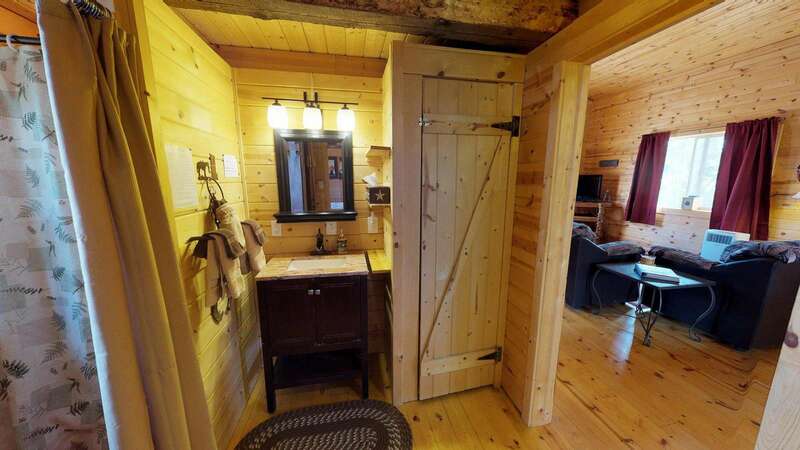 The cabin has HDTV (70+ channels) w/DVD player, FREE wi-fi, and all the linens are included. 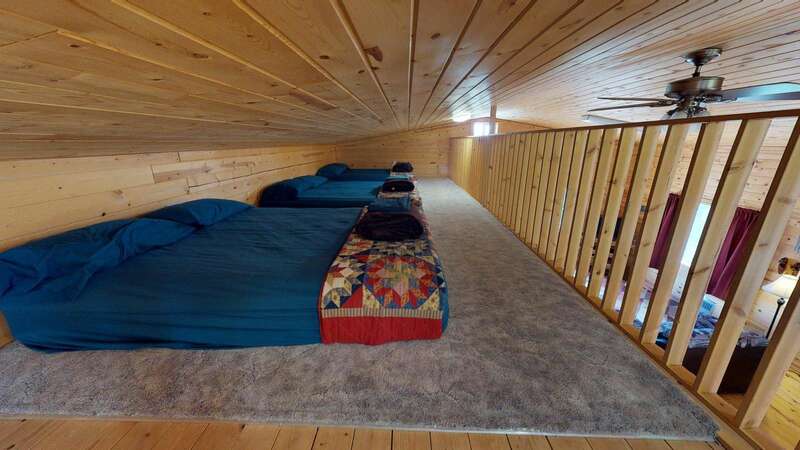 *Two bedrooms with a Queen Bed in each room, plus 3 queen mattress beds in the Loft. *Central among more than a dozen State and National Parks and Monuments. (Pets approved upon request. 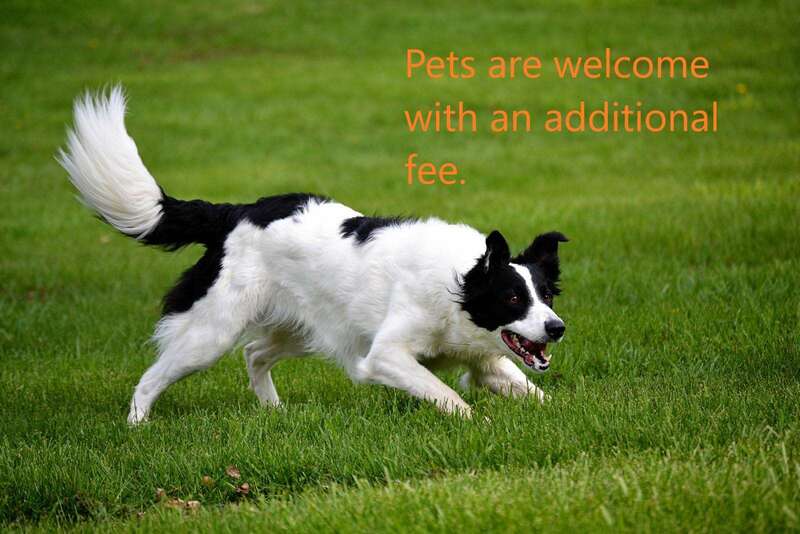 $30 fee applies, per pet per stay). This property has 5 Queen(s). Choosing to stay outside of Moab was an awesome decision because we stayed here. It was a little more off the grid than we expected which turned out to be a huge perk. There were great mountain views, and the ability to see the stars at night was awesome. The binder mapping out attractions was super helpful in making our trip. Absolutely loved the cabin! Would definitely stay here again! This place was amazing. Not too far from the road, and in a quiet little spot. Everything was nice and clean. Everything we needed was there. There was a massive book full of things to do. I would highly recommend this place to anyone! Place was absolutely amazing! Beautiful location and tons of touch to the cabin. Loads of helpful tips and hints on where to go if you’re unsure of what to do. Truly unique place. Will be returning!!!! This is our second time staying in the Canyonlands Lodging cabins, and both times we have been completely amazed by it! I almost don’t want to leave too good of a review because we want the availability to stay open for our next trip, but these cabins are perfect for anyone wanting to truly get away from the city life. The Murdock’s are super attentive and think of everything you’ll need for your stay. We stayed in the Ranch Cabin (myself, wife, and three kids) and it was the perfect amount of room for us. The kitchen has everything you need for a week’s stay and the bedrooms and bathroom are filled like a 5-star hotel. All in all, this was our most memorable trip we’ve ever taken (world travelers). 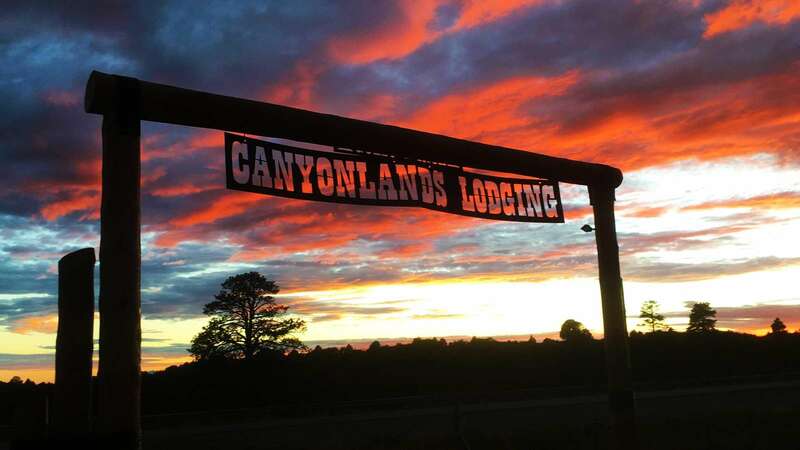 We thank the owners for the wonderful cabin and I highly recommend Canyonlands Lodging for anyone wanting an amazing stay in the most beautiful part of America (if not the world)!! This cabin was just about perfect! There is a full kitchen, large sitting area and two bedrooms, with a loft for kids with thee more beds! The the vibe was western with many authentic pieces decorating the walls. There were also lovely touches, with bottles water and a freshly baked banana nut loaf awaiting our arrival. The beds were heavenly- we slept so soundly and woke up very refreshed. The quiet was amazing, and we felt like we were a million miles from anywhere, and yet just off the highway. Hope to return to this place very soon! If you're looking for a quiet secluded place out of town, look no farther. Great space with a thorough guidebook for the area if you need a little bit of help getting around. Gorgeous ranch and beautiful home. 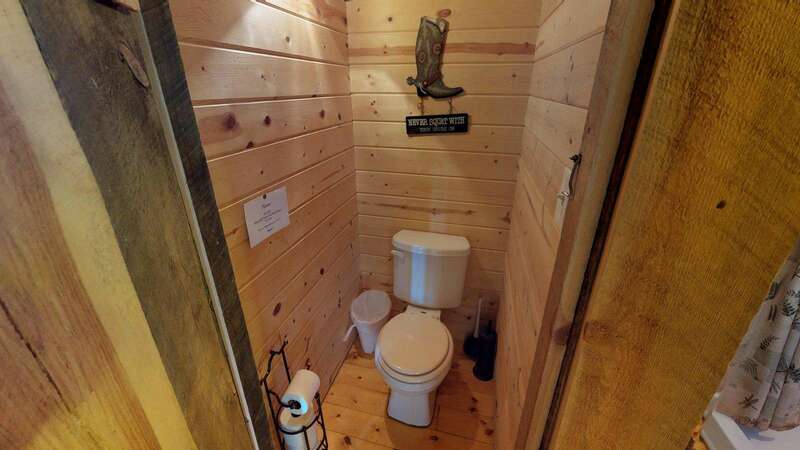 The cabin is incredibly unique. We loved our stay! This was an amazing place to stay, on way home from a long river camping trip. 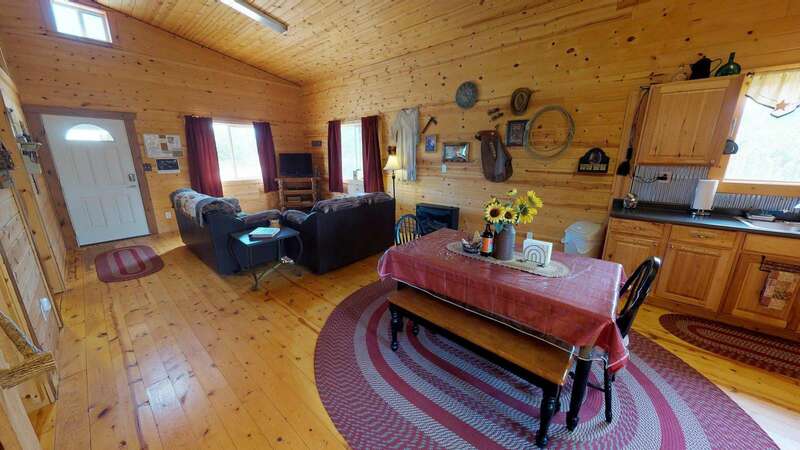 Clean, well decorated, a cabin cheaper than any hotel room in area, hiking, fire pit, bbq grill, awesome interior decor, best money ever spent on room while traveling, wish I could have stayed a week! Customer service the best. We were captivated by the charm of the mountain cabin and beauty of its location near Canyonlands National Park and Monument Valley. The host was wonderfully helpful and friendly. The cabin was well equipped, with a variety of thoughtful touches such as labeled kitchen cabinets and drawers, an easy-to-share bathroom, convenient keypad-code entry, a binder full of useful information, cell phone chargers on bedroom nightstands, and delicious chocolate-chip bread awaiting our arrival. We also enjoyed gourmet dining at the Granary Bar & Grill, located at the nearby Grist Mill Inn. We wish we could have stayed longer! A fantastic place to stay to get into the cowboy feel of the area. Everything you need is here! We had a wonderful stay, would love to go again. The kids loved their upstairs space and toys. Super detailed pack on what to do in the area, there was plenty to do for a week, our stay was too short. 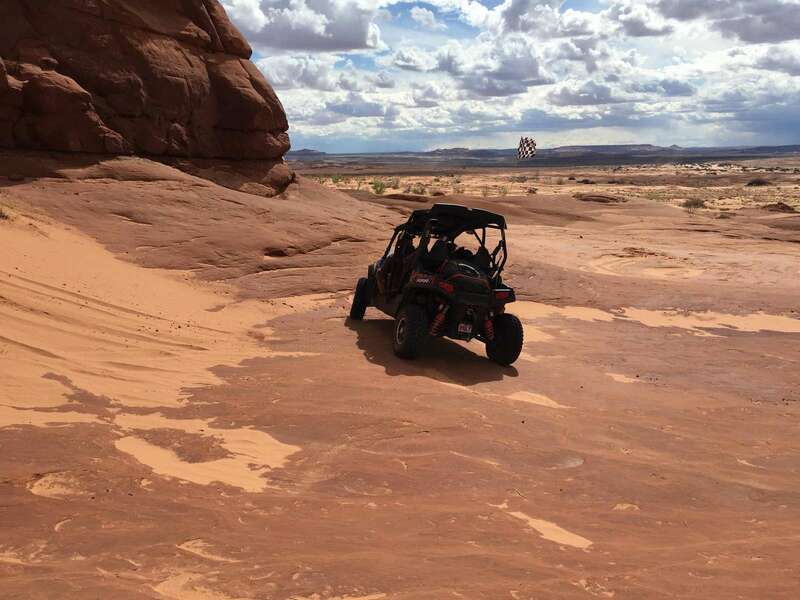 Southern Utah is a great place to visit, but it can be a little tricky finding clean, functional, and affordable accommodations. 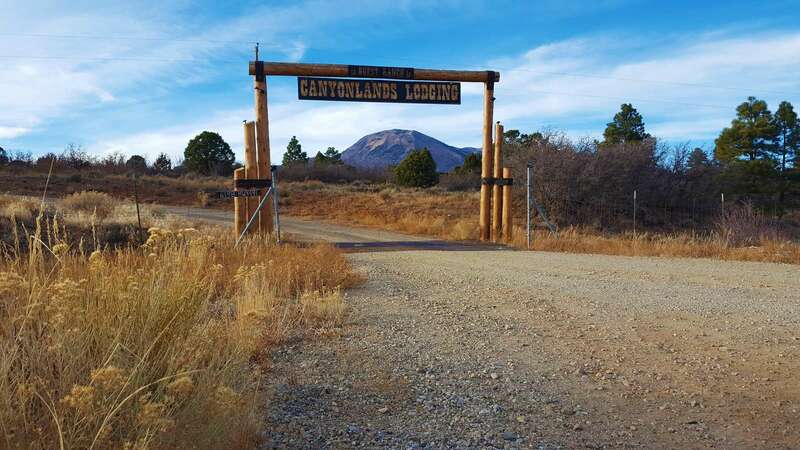 Canyonlands Lodgings is a great alternative to the outdated motor lodges and overpriced hotel rooms in Bluff, Blanding, and Monticello UT. Our 2 BR, 1 BA with loft cabin was perfect! From the moment we arrived, we felt at home. The hosts had opened up the cabin to let a cool breeze in. They had also left a cinnamon-swirl coffee cake with an introduction and welcome card- it was amazing! Personal touches like complimentary bandanas with the Canyonlands Lodging logo and a cute sign with "20 Ways to Use a Bandana" added to the wonderfully decorated cabin. Don't be concerned about only having one bathroom. The way it is laid out, it's really more like 3 separate rooms. The cabin itself is also an open layout so that the family can still be in close physical proximity, but with enough space to do different activities without getting on each other's nerves. Towels, linens, toiletries- everything is provided. And the kitchen is fully stocked! No need to bring anything but your family, food, and your luggage. There was a huge binder full of things to do in the area and places to eat. We had already planned our stay with daily tours, but now we know when we go back that there are so many other things to do! We can't wait to go back! This is a beautiful cabin located just outside of the Canyonlands National Park. Jerry provided excellent directions to the place so we did not worry about how to get there. Once we were inside, the place was very stylish and my family had a fun time. Occasionally you can also witness dear passing by, so if you enjoy nature, this place is recommended. The Ranch Cabin was wonderful! Huge space, nicely appointed, sparkling clean, with everything we needed. Especially appreciated the quiet, natural setting with hiking trails, views of the mountains and wide open spaces. Host was incredibly responsive. Hope we can visit again sometime! This cabin was just perfect for us we had a great stay our dogs loved walking around exploring. I thought there was a trail for us but it wasn’t but it was ok still we had fun looking around. We took the bikes out to look at all the area. Location was perfect close to everything. I know we will be back and try a different cabin. Thanks for the treats the I think root beer was the best!! Each morning we headed out for an adventure that included Canyonlands NP, Hovenweep NM, Natural Bridges NM, and The Edge of the Cedars Museum. In the late afternoon we retreated back to our Western Cabin, popped a cold one, sat on the porch, relaxed and chatted. The accomodations were spotless and met every need we had. Thanks to quick work by Jerry, a plumbing problem that we had created, was swiftly taken care of as we explored during the day time. We would highly recommend this rental. 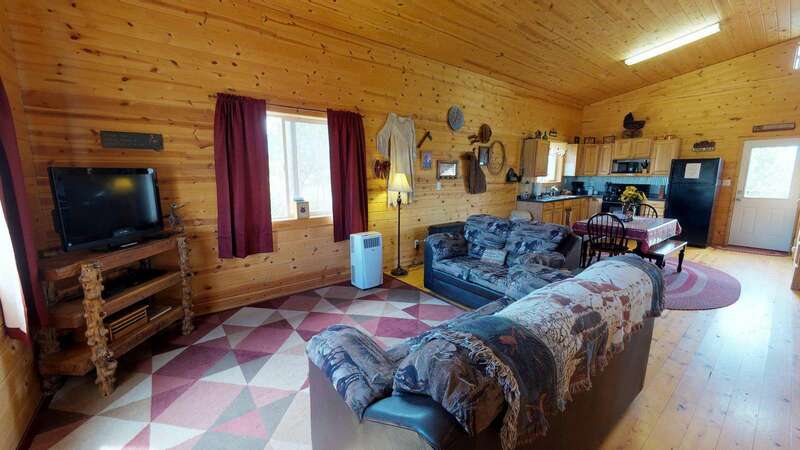 This is a beautiful spacious cabin with a large kitchen area and two bedrooms on main floor. Very private cabin with breathtaking views of the scenery and night sky. We even saw deer right outside the kitchen door. Good value for the price. Enjoyed ourselves immensely. Will definitely come back! Y'ALL - if you're anywhere close to this area, this is the place to stay! We had a wonderful time in this cozy home. It had everything I needed in the kitchen to make ourselves dinner for the night. There was a book complete with tips on what to check out in the local area that we took advantage of. I loved our time here and wished we could have stayed longer. I'd say the single drawback was the lack of bathtub (as I love a good soak after a long day hiking) but I didn't even care because everything else in the house was so comfortable, I forgot all about my usual routine. 10/10 will be coming by here again in the future. 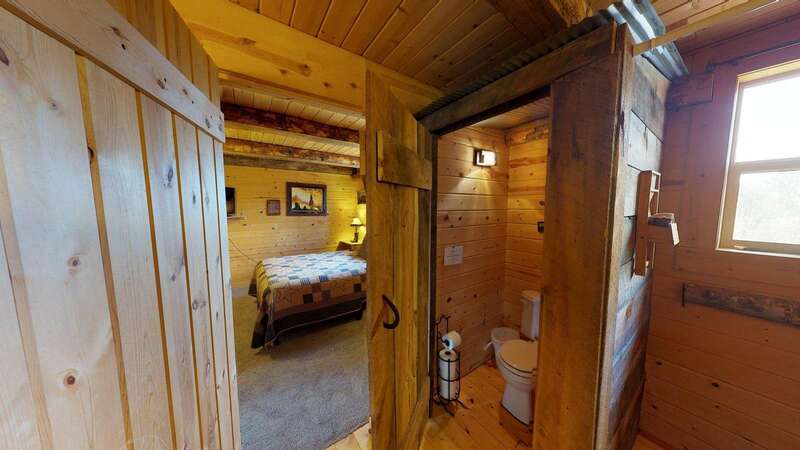 Great cabin with tons of privacy! The accommodations were excellent. I have stayed here several times and each time, I was very pleased. Will definitely stay here in the future. The upstairs loft ceiling is inconvenient. I enjoyed the cabin and all it has to offer. It had everything we needed in case we forgot anything. Plus it was decorated for Christmas. Very nice. But it was extremely warm in the cabin. It was hard to cool the place down without opening up all the windows and doors. It was less than 20 degrees outside so the doors and windows could not be open very long before it got too cold. 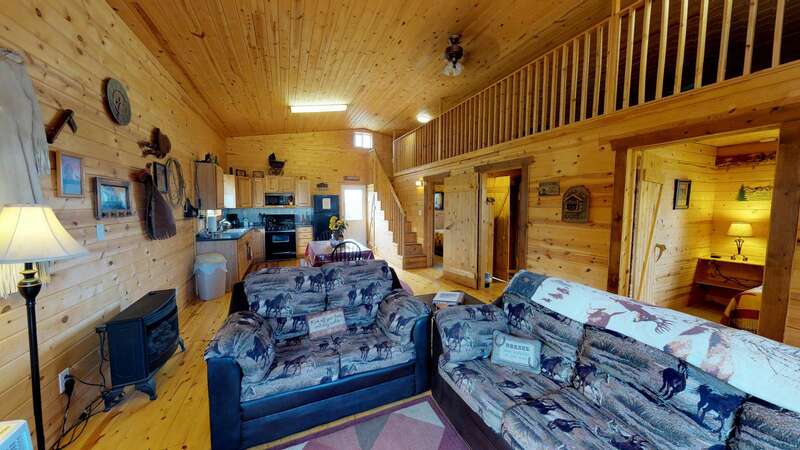 Beautiful cabin with lots of space with wonderful hospitality! It was a great pleasure spending the night at the ranch cabin! The Ranch Cabin was a great place to stay while visiting National Parks in the area. 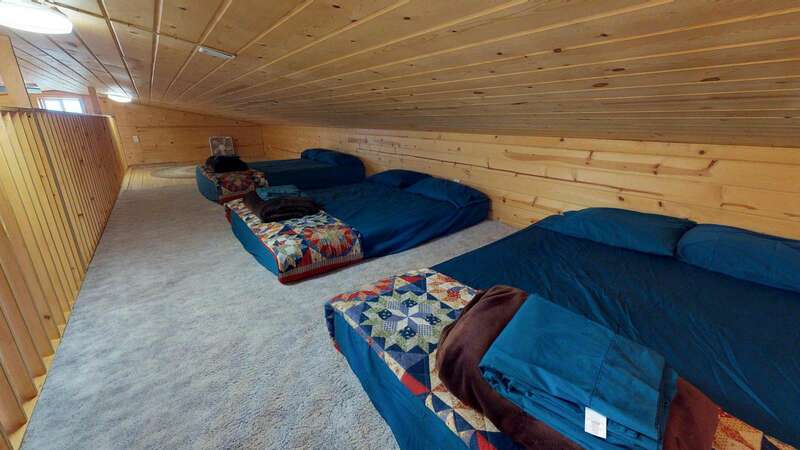 With two private bedrooms, and three more beds in the loft area, it is ideal for couples, friends, and other groups. It was clean and well maintained. Easy to access and beautiful views of the surrounding areas. Nice and quiet, peaceful, at night. 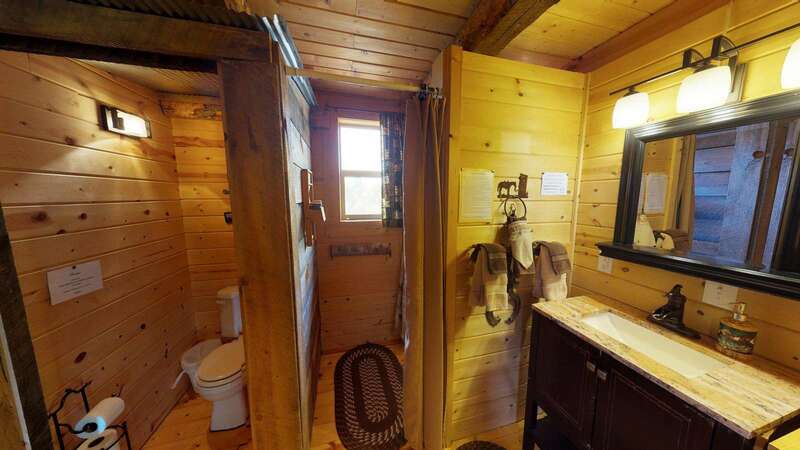 This ranch cabin is fully stocked and incredibly comfortable. We had 5 people and a dog but could have easily fit 5 more. We were 10 miles from Blanding and Monticello and easily situated for the National Parks (we visited Canyonlands). We did not meet the hosts, but they provided freshly baked muffins, which was a nice touch. Would recommend. 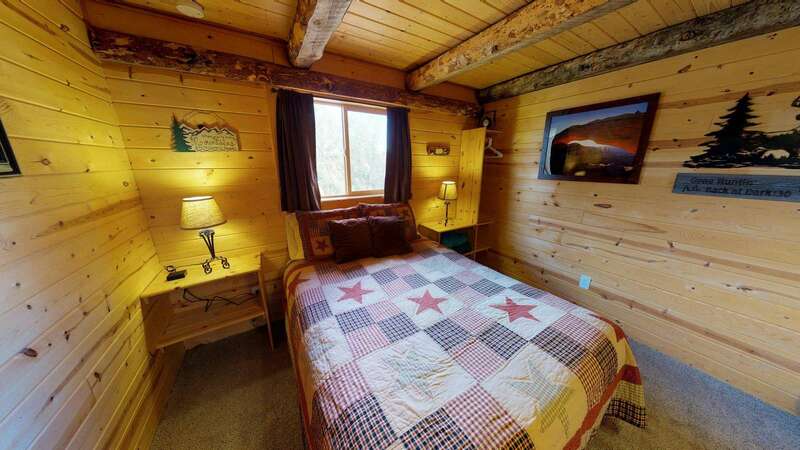 We were lucky to find this great ranch cabin last minute. 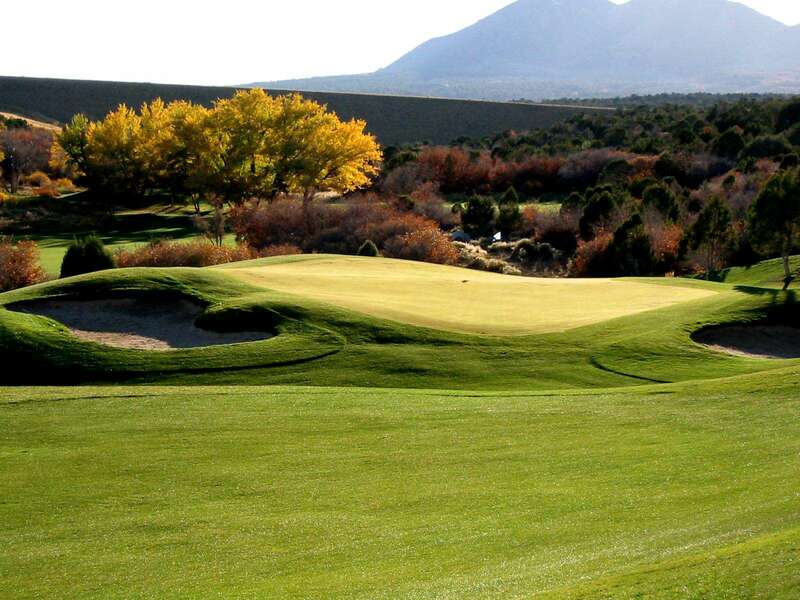 It's is in a beautiful location between Monticello and Blanding and it was convenient for day trips to Hovenweep, Natural Bridges and Valley of the Gods. 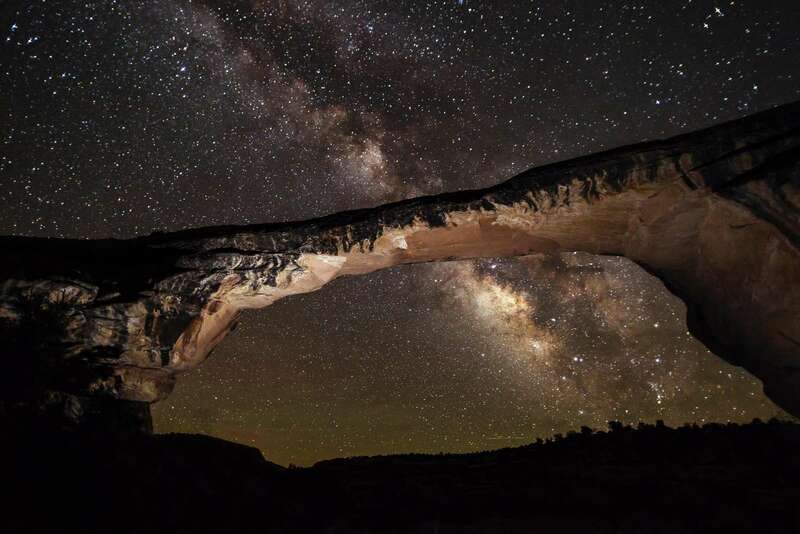 The views are gorgeous and the night skies may be the starriest you've ever seen. The cabin was more more than big enough for two and was very comfortable. There were a few staples in the kitchen left by other guests, but you'll probably need to buy most of your own if you're staying for a week and planning to cook. Plan ahead for food shopping as you'll be eleven miles from Blanding and a few miles from Monticello. Such a beautiful ranch cabin in a secluded spot. The Ranch Cabin exceeded our expectations. So much nicer and a greater value than renting two hotel rooms for the three of us, a couple with Dad. Two rooms with Queen beds, Full kitchen and a loft with three full to queen sized beds made me think I could come back with my three boys and do a fantastic hiking, sightseeing vacation of the national parks from here very economically. Easy booking and convenient keyless entry to the cabin. Immaculate, and cozy. The propane fire was warming inside and out, as was the complimentary Sasparilla, hot chocolate packets. Loved the ranch,cowboy motif; the men loved it. Dad said he could see himself retiring in a place like this! Caiden at the front office was very professional, courteous, informative and helpful. We were very pleased with the location and cabin. There are multiple structures spread out over a 65-acre ranch. This was a very quiet place except to hear the highway in the distance which virtually disappeared at night. 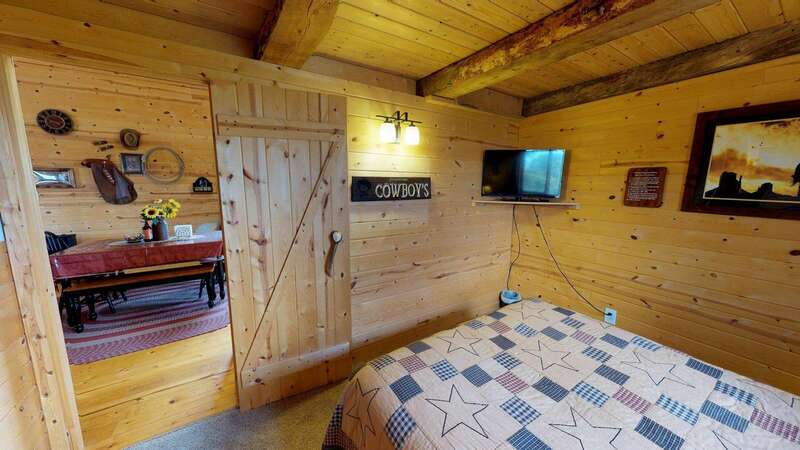 The Ranch Cabin was very nicely furnished and very much in keeping with the theme of a "western" cabin. Only negative thing we can say is that the beds could be improved upon. Got off the beaten path and stayed in the Ranch cabin. Incredibly comfy with everything needed for a home away from home. Relaxed on the porch and took a lovely walk along the canyon with views in all directions. Stunning Milky Way at night. We had a great family time at the cabin! It was clean and had everything that we needed. It was spacious enough that we didn't feel cramped, but small enough that we all got to be together. Beds were comfortable and even though we didn't see anyone until right as we were leaving we felt well taken care of! We arrived to muffins and sarsaparilla. Contact information was there for us if we needed anything, but we had all the privacy we needed to have a fun family vacation. Ranch Cabin was perfect. Great location to reach all of the National Parks in the area. Easy to find and peaceful location. Grocery store not far away in Monticello. Clean and well-equipped kitchen. Couldn't have asked for better place to stay. The ranch cabin by far exceeded my expectations. My only regret was that I did not stay longer. 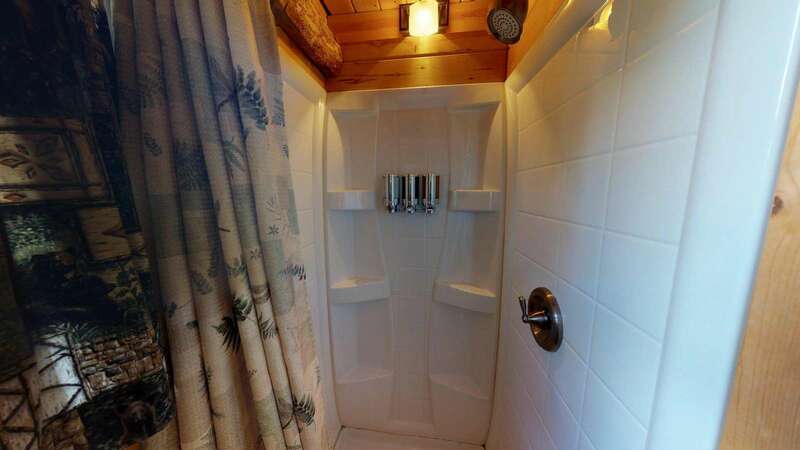 I was concerned about a singe bathroom for a family, but the layout was perfect. Separate access for the sink, shower, and toilet. Lots of charm and personal touch. Loved it. Would stay again. My boyfriend and I stayed here one night in the midst of a week of adventures across southern Utah. The check in process was a piece of cake. The place looked exactly as advertised, offering a peaceful view of the mountains from the balcony. Inside was clean, very well maintained, and offered any amenities you might want for a short or long stay. The town was very small - we were able to get anything we needed at Dollar General, and also ordered some great pizza at Wagon Wheel. We definitely want to come back here if we can! Lovely getaway in Monticello. Loved the cabin and the location - very well taken care of, very clean and beautifully decorated. It was a great experience and we will definately come back. We arrived safely and found the most beautiful home we could imagine for our stay, The Ranch Cabin. Thank you! We had a great time staying at the Ranch Cabin. It was neat and clean and very nicely decorated. The kitchen was well stocked so that cooking for a group was easy and pleasant, especially since the choice of restaurants for dinner is quite limited. The location was perfect for all of the canyon hiking side trips we did and it was incredibly quiet around the grounds day and night. There was a cute patio off of the back with a grill and fire circle close by. There were plenty of towels and supplies for our whole group and everything was in great working order. I highly recommend staying there if your travels take you near the canyonlands country. Will definitely be back! We stayed eight days in the Ranch Cabin. Everything was clean and ready to go when we arrived. We would be thrilled to stay with you again if we are in the area. We stayed at both Ranch Cabin and Africabin. They are both very nice. Ranch Cabin is a little bigger if you have a larger group. I was not expecting to love this place as much as we did! It is hard to tell from a few photos online. I was concerned about everything being old or musty. I have allergies and, after all it is a ranch,but NO,everything was super clean and new.Towels and linens plentiful and plush. Mattresses were great. Everything you need including nice shower gel shampoo and conditioner. It was very private, cozy and it felt like home before we left! Jerry gives great advice on what to do while there. We took a great trip that we hadn't planned on his recommendation. It was awesome! Don't limit your time to Arches and Canyonlands. Inja the ranch dog watched over me on a hike to the canyon and sat with me on a rock until he saw me safely back to the cabin. We stayed at a very fancy and expensive motel in Durango and didn't enjoy it as much as staying here. 1 hour drive to Moab and 1 1/2 hr to Monument Valley. A lot to do with some driving but worth it to see deer grazing outside your window in the morning. Rented the Western Ranch Cabin for 4 nights - our aim was to relax after exploring National Parks hiking & kayaking for 2 weeks with the opportunity to visit area parks and attractions - mostly without crowds. Watching the annual show in early August of shooting stars was spectacular. The cabin accommodation was excellent - comfortable, clean, with good outdoor space including gas grill. Each rental property is in its "own space" so it is quiet and peaceful. The managers are most helpful in assisting in identifying local attractions to visit - in particular we enjoyed a kayaking trip away from the crowds in Bluff on the San Juan River. “Jerry made sure we did not face any problems locating the cabin by providing us a pin drop on maps and the exact directions to follow while driving up to the place. The door was kept unlocked for us as we had requested and there were some welcome goodies waiting inside for us. The cabin was immaculate from inside and was as per the description. The fire pit and large living area were an added bonus for sitting together and enjoying a nice night. 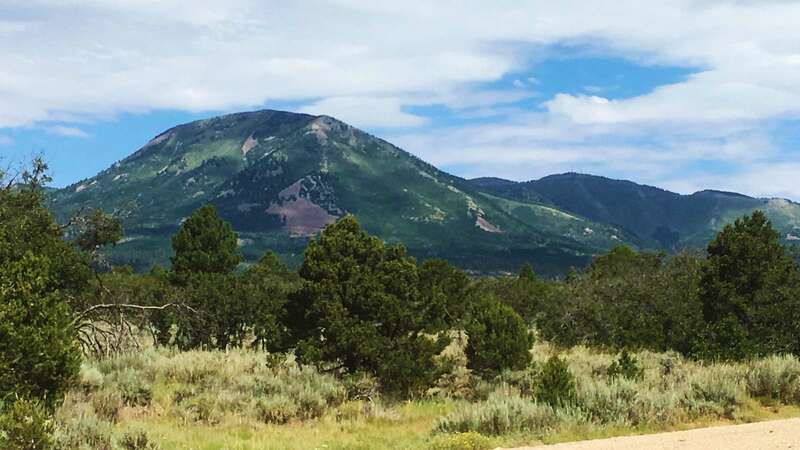 The cabin also had a nice view of the La Sal mountains and 2 adorable dogs lived nearby which added an additional fun element to the stay. We were very pleased with the Ranch Cabin! The place was very clean, had lots of room, had nice rustic decor, had plenty of things to cook with & was in a good location for visiting both directions. Jerry was very helpful to send us to the perfect places. We loved the little treat on the table! The cabin was very nice, modern and all the comforts of home. The views were great. After 6 days we were sorry to have to leave. We enjoyed all the animals on the property. Everyone were friendly and helpful. Cozy, clean, store nearby...just a wonderful, too short stay. Just wish they had left the Wi-Fi password available. What a special place! We stayed in the Ranch Cabin - one night wasn't long enough. Great location, the cabin itself was very charming, clean and super comfortable. We can't wait to return again!! Excellent cabin. Everything was clean and the cabin is spacious. The kitchen was 100% stocked with all of the pots/pans/dishes, etc. that were needed. Jerry and Tina were great, as were Boots and Inja - their dogs. Excellent location to get to Canyonlands, Arches, Natural Bridges, etc. 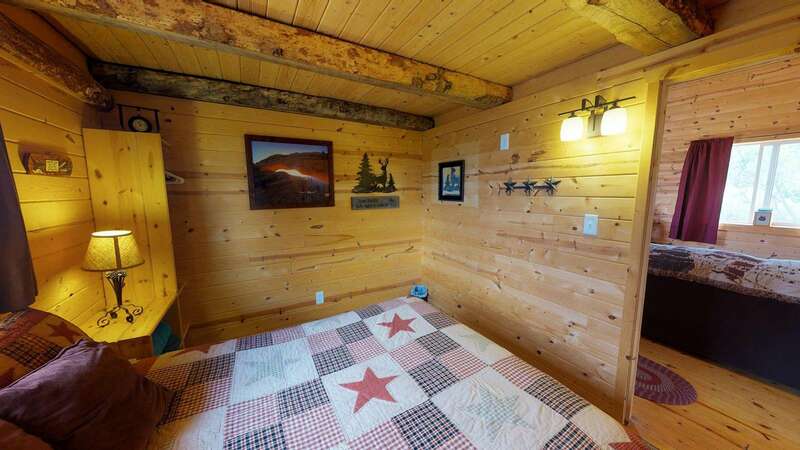 We would definitely recommend this cabin to anyone looking to stay in that area. One of the greatest rentals we have ever experienced. We stayed in the Ranch Western Cabin. Every step was carefree and the owners very easy to work with. Our cabin was immaculate with perfect attention to detail. 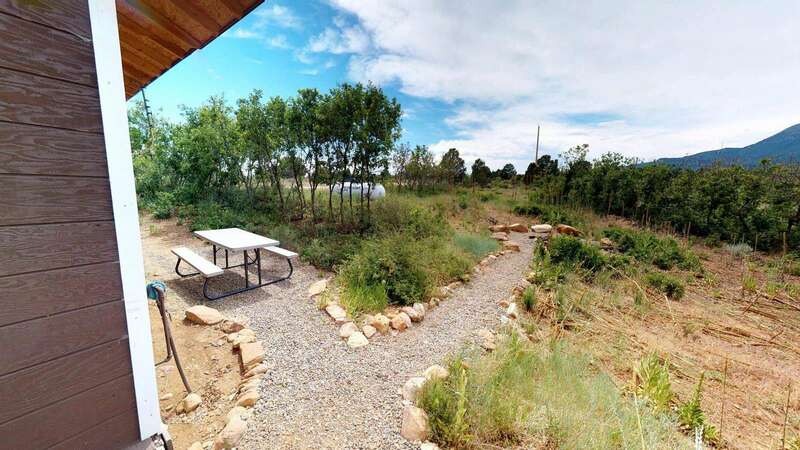 The grounds are very well maintained, close to many attractions and convenient from the highway. It made a perfect vacation even more perfect. Loved visiting with the dogs and the morning sunrise was so beautiful. Thank you for allowing us to stay with you and we will see you again. We were so impressed with the cabin! We just stopped through for the night but would have loved to stay for weeks!! Absolutely perfect - so clean and homey! I had to check my email receipt to make sure I hadn't read $120 as $1,200 as it would have been worth it! Thanks again! Great job!! The ranch cabin was very clean & comfortable. Thank you for the chocolate chip cookie welcome! We enjoyed the fire pit & the star filled sky. We used the grill but only one burner would light. The grill needs some attention/repairs and a new cooking grate. Other than that I would recommend staying there. We had a great time! Response: Thank you for your stay, and for pointing out the BBQ grill issues, we have replaced it with a brand new one for you, hurray back soon. We stayed in the Ranch Cabin for 3 nights. It was a great base camp for visiting Arches, Canyonlands, and Grand Canyon National Parks. 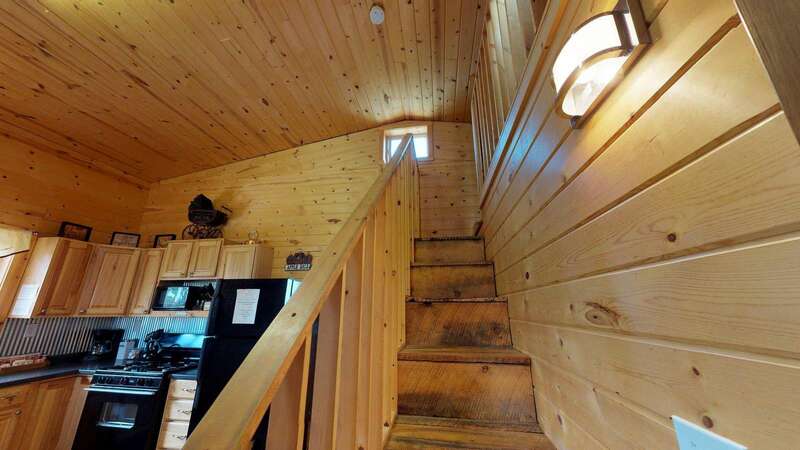 The cabin is very cozy, with modern appliances. When we arrived, we were immediately greeted by Inja and Boots, the ranch dogs. They are super friendly and cute. Solid wifi and cell service, so we didn't have to go totally off the grid. Great stay! My husband and I stayed at Ranch Cabin one night on our way to SLC because we didn't want to drive all the way in one day and we didn't want to stay in a hotel. The cabin was so roomy, very conveniently furnished, and extremely clean. We had originally booked a cabin in town, but Canyonlands graciously offered this larger, roomier, and more secluded cabin at no extra cost! What wonderful customer service! The ranch cabin was perfect for our destinations-the needles, monument valley and the natural bridges national monument. We stayed 3 nights. The cabin was extremely clean and comfortable. We hiked heavy during the day, had dinner in Blanding and came back to chill and watch movies at night. The only negative was the lack of Wifi. We contacted the owners and hopefully they can get the kink worked out. 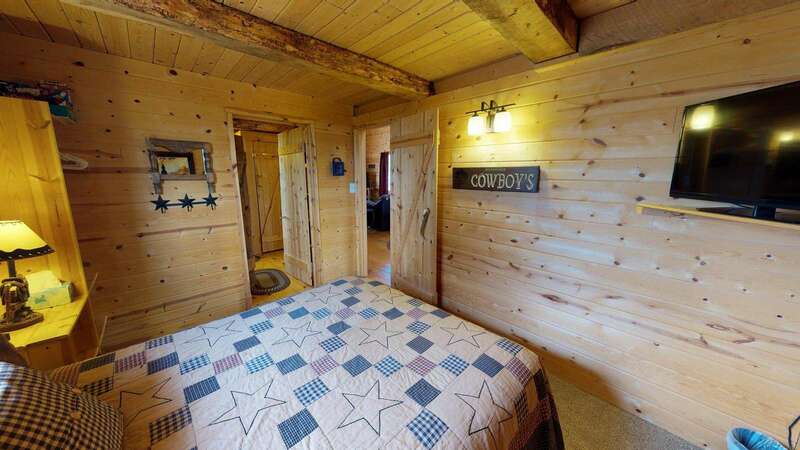 We loved the Ranch Cabin and your western, cozy, comfortable decor. It was a great location for hiking in Needles area of Canyonlands, canyons along Hwy 95 and out the door step thanks to your great map and directions. We will definitely be back and tell our friends about your fabulous rentals. We spent four days at the Ranch Cabin in mid-April. 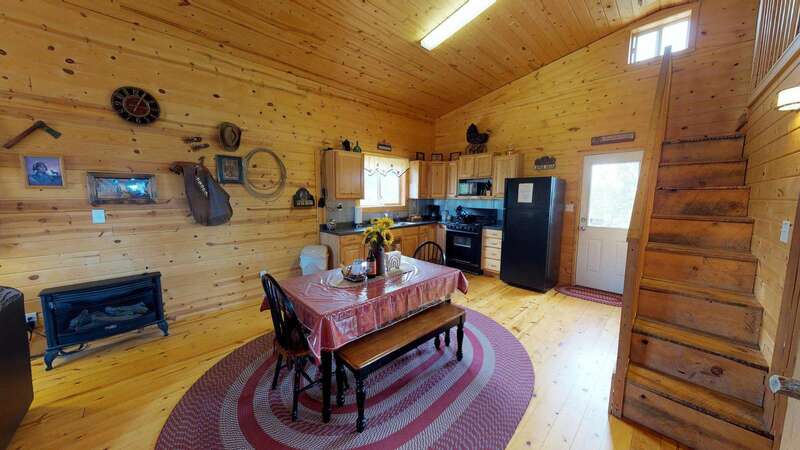 The cabin is well maintained and nicely decorated with newer appliances and furnishings. It was a nice "base camp" to explore the many opportunities for hiking, scenic drives and museums near Blanding. We would readily stay here on another trip. We stayed in the Ranch Cabin for a couple of nights, partly based on a decision to avoid Jeep Sarari up in Moab. During our week long vacation, we stayed in three different places, and the Ranch Cabin was our favorite. Lots of room, a terrific dog that roamed around, great nighttime star-gazing, and an excellent breakfast/lunch spot in nearby Monticello (Peace Tree Juice Café). Response: Yes, the Ranch Cabin is very quiet and private. Thanks for coming!